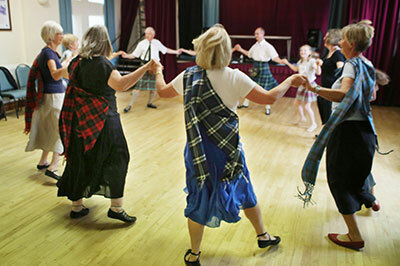 We are registered as a charitable organisation teaching Scottish country dancing according to the guidelines laid down by the Royal Scottish Country Dance Society. RSCDS Exeter was founded in 1969. 2019 will be our Golden Jubilee year, and celebrations will mirror those of 2009. In May 2009, when the branch celebrated its Ruby anniversary with a ball, six founder members attended. The ball began with branch founder, Naomi Fraser-Holland, and 80 dancers being led by a piper in a Grand March. Strathallan provided the music for the evening and the programme included dances written by the then Branch President, Sue Tyler (The Powder Monkey) and Chairman, Duncan Brown (The Zoologist). These dances, along with ten others devised by Exeter Branch members, were collected in a book to mark our 40th anniversary. It is planned to publish a 50th anniversary book: watch this space.